While marijuana’s full exit from prohibition is still in question, the change in public opinion on the matter has paved the way for the now booming medical marijuana industry. In the last year, a number of traditionally conservative states, including Georgia and Texas, have passed reform laws legalizing and regulating medical marijuana markets in their states. Now, digital health entrepreneurs and investors are beginning to target the previously ignored market as its future solidifies and legal risks diminish. In April, Privateer Holdings raised a $75 million funding round led by Founders Fund, bringing the four-year-old startup’s total raised to $82 million. Privateer operates a number of marijuana-related businesses including a ZocDoc-like service called Leafly that lets patients rate dispensaries and marijuana strains, as well as book appointments with physicians to talk about marijuana treatment options. Leafly boasts five million monthly visitors. 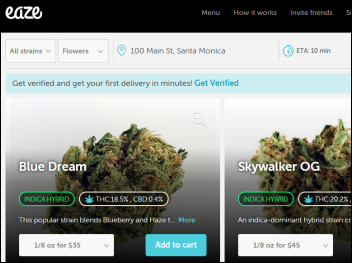 Eaze, a California-based marijuana startup, launched an app-based marijuana delivery service this year, and just this week announced that it would begin offering video-based doctors consultations so that users could get both a prescription and a delivery order on the app, legally. The company also recently announced that it has closed a $10 million Series A led by DCM Ventures, with additional participation from Fresh VC, 500 Startups, and Snoop Dogg himself. The new funding brings the one-year-old startup’s total VC investments to $11.5 million. Competing with Eaze in the San Francisco market is Meadow, a Y-Combinator graduate focused on creating an app-based medical marijuana delivery service. Meadow connects patients with local dispensaries and acts as a middle man to facilitate delivery. The company also offers physician consultations, but unlike Eaze, Meadow coordinates in-home physician visits rather than video-consultations. The company is the first marijuana-related business to be accepted into Y-Combinator’s exclusive accelerator program. Eaze and Meadow are not operating alone in the Bay Area. Startups Nugg, Canary, and Nestdrop are all building similar businesses, hoping to scale nationally as state restrictions continue to erode. Colorado-based startup Potbiotics is marketing an EEG-based cannabiniod sensitivity test to doctors and researchers that it hopes will help the medical community gain insights into what cannabiniod levels are needed to effectively treat the wide variety of ailments currently being managed with medical marijuana. The startup is also marketing what it calls the PotBot, a device designed for dispensaries that will recommend ideal strains of marijuana based on a patient’s EEG sensitivity results. The PotBot system also includes a fingerprint reader and facial recognition software to help dispensaries ensure that they are only selling marijuana to the appropriate patients. Lastly, the startup is marketing customized grow plans to pot growers based on genetic analysis of submitted seeds. While the medical marijuana industry is undeniably growing, it still has quite a bit to prove to the medical community. A recent JAMA study concluded that marijuana edibles and extracts, which are currently being used with some success to treat pediatric epileptic patients, have such a wide variability in potency that strengths “can vary from 1% to 155% the amount listed on the product label.” The study also found that only 17 percent of tested products contained the amount of THC listed on the label. A separate systematic review published in JAMA this month recapped the results of 79 randomized clinical trials testing the effectiveness of marijuana on: nausea due to chemotherapy; appetite stimulation in HIV patients; chronic disease management; depression; anxiety disorder; glaucoma; spasticity; and others. The review concluded that there was “moderate-quality evidence to support the use of cannabinoids for the treatment of chronic pain and spasticity,” but little evidence to support other uses. With medical marijuana suddenly gaining both public support and the interest of medical communities, digital health entrepreneurs are finding investors more willing to back startups focused on the market. While entrepreneurs working in this market do still have considerable legal barriers to face, one notable advantage the companies have over traditional digital health startups is strong consumer demand and unprecedented market growth. SFGate reported in January that the medical marijuana industry has grown 74 percent in the last two years to $2.7 billion.